Jacob Jensen has created one in function and Design extremely unusual quartz clock, which indicates the time in a new and innovative kind. Time in a different way. The clock shows no hands, numbers or digits! The time is shown by segments and the inner circle indicates seconds and flashes once every second. The hours are shown in the large inner circle which is divided into 12 pieces, each representing one hour. Minutes are shown in the outer circle in segments of one minute each. The clock is equipped with an alarm, an infinite snooze-function and a key-lock function. The clock is also equipped with a built-in background light. The illustrations show seven hours and 45 minutes active; therefore the time is 07.45 or 19.45. Material: glass, steel and ABS. Size: ca. 7.6 x 6.2 x 2.5 cm. 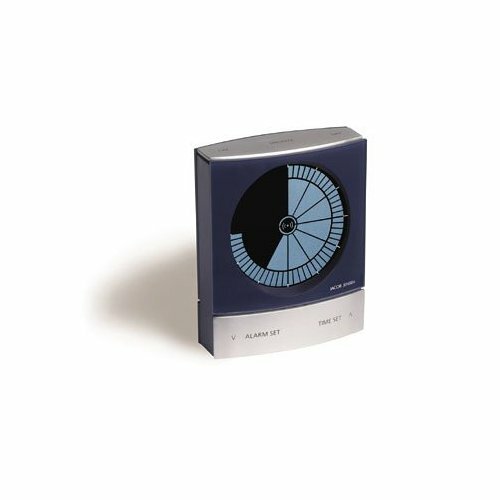 You will receive the beautiful Timer Clock in a decorative gift box with operating instructions and batteries. JACOB JENSEN - This name is program: often copied and never reached. Singular design combines with a new aesthetics and functionality. Discover the special in the JAKOB JENSEN Design, the quiet beauty in completely everyday products, the unique and unmistakable JAKOB JENSEN Design.